I purchased a Kimber Ultra Carry several months ago and it has become my favorite .45 ACP. My other .45’s include two government models, a Lightweight Commander, and an Officer’s Model (customized by an excellent local gunsmith). 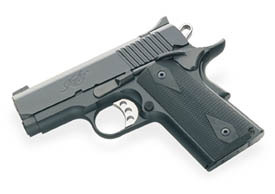 The Kimber is equal to the custom Officer’s Model and better than the factory Colts. It has all the options from the factory that I paid the gunsmith $600 for (plus $500 for the gun). I chose the Ultra Carry not for it’s short length but for the weight. I carry all day (actually all night) wearing a business suit. The 25 oz. of the Kimber is much easier to wear for 9 hours +. After a few hours, my Officer’s Model would become a heavy burden to carry . The best holster I have found for belt carry is the excellent IWB Blade-tech Kydex. It holds the gun firmly but is quick to draw from and doesn’t collapse when the gun is drawn. It can be worn all day with no discomfort . The best deep cover holster IMHO is the Thunderwear. I know, I know, I was skeptical too until I tried one. Now I have two! The Kimber Ultra Carry shoots very well, is very accurate, recoils less than an all steel Officers Model, and comes from the factory with all the worthwhile custom features needed on a concealed self-defense weapon. It is now my primary weapon on my CCW permit.